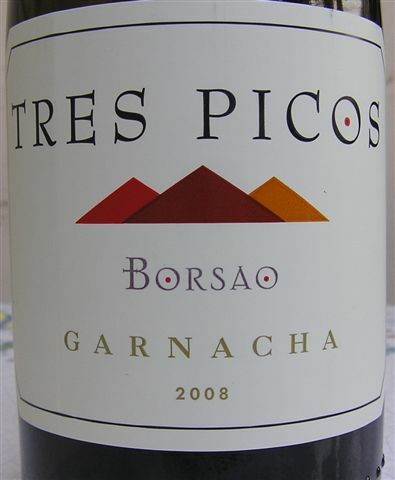 Tres Picos 2008 Garnacha hails from Campo de Borja. Campo de what? Borja, the Spanish name for Borgia, the infamous Italian Renaissance family of Spanish heritage whose scandals gave nobility a bad name. Reds rule in Campo de Borja, and none rules mightier than Garnacha. The region, recognized as a D. O. (Denominación de Orígen) in 1980 lies within Zaragoza province, southeast of La Rioja. Although it is home to only 17 wineries, Campo de Borja Garnacha casts a long shadow to fans of this spicy varietal. Bodegas Borsao 2008 Tres Picos is made in a modern style, with rich, mouth-filling texture and plush flavors of blackberry and dark cherry fruit. Herb and spice notes unfurl cloves, pepper and anise followed by leather and sweet pipe tobacco. Over and above its seductive aromatics, the wine's greatest reward is its food-friendliness. Try it with grilled sweet Italian sausage and a dab of Walla Walla onion whole-grain mustard. Garnacha goes by Grenache in France and many parts of the New World. Italians know it as Cannonau, a word taken from Sardinian dialect, and the place where the grape probably originated. Although Garnacha is known for high-yielding vines and ripe, alcoholic wines, the grapes grown for Tres Picos have it tough. Harvested from old vines that struggle in poor soil along rugged edges of hillside terrain, the meager yield of two tons per acre produces concentrated wines, expressive of terroir and layered with flavor and nuance. If you're warming up to Spanish wine, look for the name of Spanish importer Jorge Ordoñez on the label. More often than not, an Ordoñez pick lands a winner of uncommon wine goodness and value over many price points. Find this beauty at Palm Desert's LA Wine Company and Dan's Wine Shop for less than $15 a bottle.